With winter in full swing all we really want to consume are brownies, cheese-laden pastas and bread slathered in butters and jams while sitting as close to the fire as humanly possible. But keeping our health in check is certainly important. We got in touch with one of our favourite dieticians again, Kelly Lynch to help us out when it comes to making smoothies appealing in winter. My mantra, as a dietician and now a life coach is always, ‘Am I nourishing my body?’ If we approach winter with this mindset, we will be sure to come into spring feeling healthier, leaner and happier in our skins. This nourishment focus is key when deciding what goes into my smoothies, as well as the meals I eat during the rest of the day. So, in trying to be ‘climate-change savvy’, I like to include seasonal fruits into my morning smoothies, as well as to add a dash of comfort to each of them. Doesn’t a smoothie loaded with full creamy yoghurt, fresh guava, raw honey and ground cinnamon sound so comforting and delicious? These foods also have such nourishing qualities, so they meet the mantra criteria. TIP: I usually add about 4–6 ingredients into my smoothies (see below examples). I like my smoothies to be my whole breakfast meal, so I load them with as much nutrition as I can. Due to it being winter, I use fewer green leaves and berries and more yoghurts, nut milks and seasonal fruits. If we look at our general diet during winter, we need to focus on foods containing vitamin C and Vitamin B, as these two antioxidant-rich vitamins help boost immunity. Vitamin C rich foods are generally red, yellow or orange in colour, so consider blending some citrus fruits in your Nutribullet and have fresh citrus juice, with all the fibre and goodness still intact. Vitamin B is found in your green foods and these can be tough to get in, during the chilling months. Aim at making a green smoothie regularly loaded with baby spinach, celery and broccoli to boost your vitamin B levels. As I always say, ‘conscious eating’ ensures that we are optimally healthy. So if we are conscious of buying the right, colourful fruits and vegetables at the grocery shop, they will certainly have a direct effect on your health when you consume them this winter. 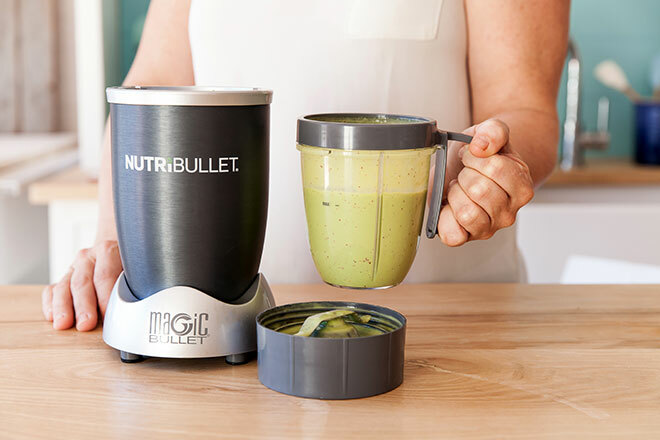 Chuck all the ingredients in and blend in either your Nutribullet or Nutribullet Pro for the fastest healthy smoothie. What’s your favourite winter smoothie recipe? We’d love to know how you’re maxing your fruit and veg intake during the colder months. Thanks again to Kelly Lynch for her delicious smoothie making insight.